I'm in Los Angeles for the next week (YAY!) and needed to kick things off with a manicure that would make me feel happy and excited. I immediately went for Deborah Lippmann Glitter In The Air. This is one of those colors that I needed in my collection the second I saw it. I fell in love with it at first sight! The creamy pale blue base, the pink and turquoise hexagonal and micro glitter flecks suspended inside, how its intensity builds with each coat ... adding this polish to my stash was a no brainer. I had gotten a manicure with this shade before (click here to see it) but admittedly hadn't used it in awhile. I was just waiting for a special occasion to trot it out again! And I'd say my trip to LA definitely qualifies. Let's just take one more look at this color, shall we? Every coat (there are three here) adds opacity and more of the turquoise and pink glitter. This polish is definitely a keeper. Cheers to my time in LA being fabulous now that it's on my tips! 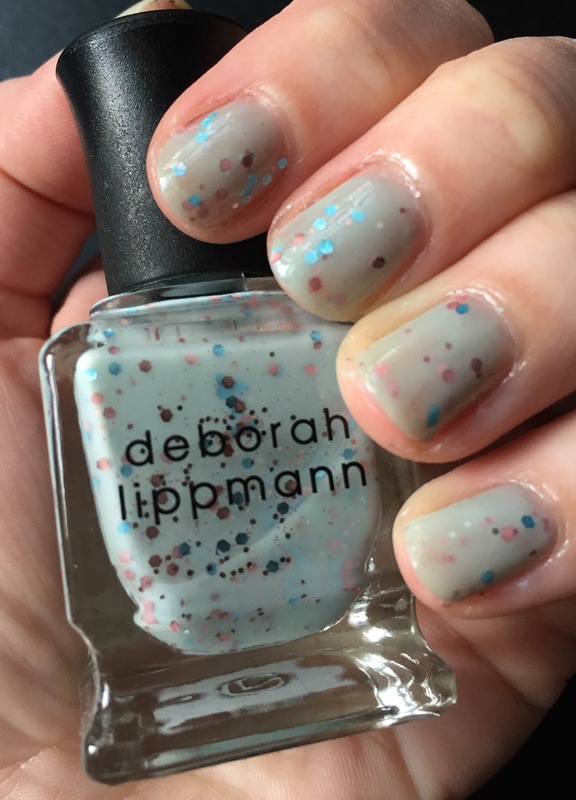 Deborah Lippmann Glitter In The Air retails for $20 at beauty.com. I love the glitter! I usually put this one over a base because I need it to look even and opaque. One of my polish OCD's =( I love the color, tho, so I always like to use it! This is definitely a cute and fun shade. Love the glitter within. Oo I like this a lot! I like a bit of glitter but I don't like it being too "in your face" so this looks perfect! Definitely something I'll have a look at!